A PENSIONER died after being twice mauled by a police dog which attacked while his handler was leading the chase for a suspect through the woman’s garden, an inquest heard yesterday. Irene Collins, 73, screamed “why has this happened to me” as force Alsatian Dano returned to bite her for a second time after it had already been dragged off her by a handler. Mrs Collins, who had lung cancer and chronic obstructive pulmonary disease, died four days after she was repeatedly bitten on the arm and legs as she cowered in her kitchen. A jury at Teesside magistrates court heard how the pensioner’s son Eric arrived at his mother’s Middlesbrough home shortly after the incident in July 2014 and told an offcer the dog attack “would finish her off”. Despite her injuries Mrs Collins was able to give a brief description of the incident to a police inspector who visited her in hospital: “I was in the kitchen when the dog came in. I thought if I stood still it would not bite me, but it bit me on the arm. PC Mark Baines and Dano had been dispatched to help find a man after a car with heroin and cash worth £100,000 was stopped by colleagues. While two people were arrested, one suspect managed to flee. Armed officer Sgt Neil Yates told the hearing how Mrs Collins had granted police permission to enter her land when told they believed the suspect was hiding in someone’s garden. But he agreed she would not have been aware a dog would be involved in the search. The jury was told Dano carried out a sweep of the garden, with PC Baines, when the animal suddenly made his way into the house. Sgt Yates was outside the property when he heard over the radio that the dog had bitten the householder. He found Mrs Collins lying on the floor, bleeding from the head, with Dano still biting her forearm as PC Baines shouted for it to “leave” as he grabbed at its collar. He managed to get the dog away into the hallway and, as Sgt Yates went to treat her, PC Baines shouted at him to close the door. But the dog got free and launched a second attack, biting Mrs Collins on the leg before grabbing her with his jaws. He said PC Baines grabbed the dog by its collar and managed to get it off the pensioner for a second time. Matthew Donkin, for the Collins family, asked if Sgt Yates, who was carrying a pistol, ever considered shooting the dog. First aid was given, an ambulance was called and Mrs Collins was taken to the James Cook University Hospital where she died four days later. A Home Office pathologist initially reported she would not have died had she not been bitten. The coroner said the inquest, which is scheduled to last five days, will consider how the dog got into Mrs Collins’ home, its training and previous behaviour. 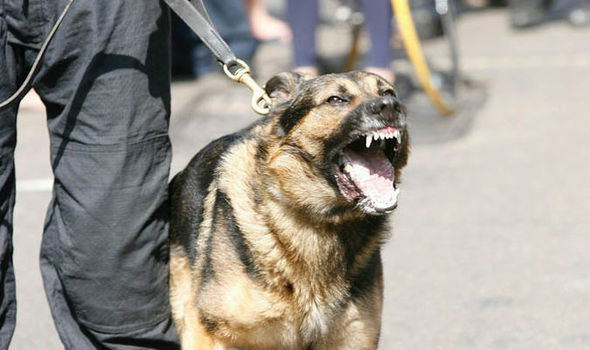 Police dogs not always so well trained.